Erect stem, 0.5 to 1.5 meters high. Leaves are numerous, linear-lanceolate, 1 to 1.5 meters long, 5-7 cm wide, the margins sharply spiny-toothed, green and shiny on the upper surface, pale on the lower surface. Heads are terminal, solitary, ovoid, 6 to 8 mm long. Sepals are ovate, thick and fleshy, about 1 cm long. Petals are three, oblanceolate, about 2 cm long, white below, violet above. The fruit is 20 cm or longer. Widely cultivated in the Philippines in two forms: Native and Smooth Cayenne, the latter introduced from Hawaii. The native variety has a much higher carbohydrate content than the Cayenne variety. Both are fair sources of calcium and iron, good sources of vitamins A and B, and excellent sources of vitamin C.
Contains citric acid, phosphoric and sulfuric acid, lime, magnesia, iron, silica, sodium and chlorides of potassium. Anthelmintic, vermicide, diuretic, aperient, antiscorbutic, diaphoretic, refrigerant, digestive, styptic, emmenagogue. Antihelminthic property of fresh fruit juice attributed to its constituent, bromelin, a proteolytic ferment, that is toxic to Ascaris lumbricoides and Macracanthorynchus hirudinaceous. Fair source of calcium and iron; good source of vitamins A and B; excellent source of vitamin C.
Juice of leaves: anthelmintic; used for intestinal animal parasites (decoction of fresh young leaves, 4x daily). Ripe fruit good for acid dyspepsia and aids digestion,. Juice of ripe fruit increases urine flow, gently laxative, cooling and digestive. 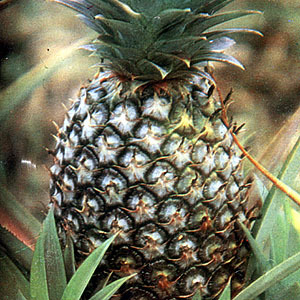 This entry was posted in List of Medicinal Plants in the Philippines and tagged pineapple, pinya on March 25, 2009 by Pinoy Herbs.